Except for the kickers, it can be a difficult task to try and figure out who will be the key performers on a club’s special teams roster. The reason I say that is the makeup of the bottom half of the roster, as most club’s is so different from year to year. One thing that is certain around the league is where the special teams core players come from. At the wide receiver, corner, safety and linebacker positions, the depth players at those positions make up the bulk of a clubs special teams performers. For example, if a club keeps six wide receivers the fourth, fifth and sixth receivers have to be good special teams contributors. All the backups at linebacker have to play on cover teams, as do the backups at corner and safety. Because of this, often a club’s fourth through sixth receivers on their roster aren’t necessarily the clubs fourth, fifth and sixth best receivers in camp. A player with better special teams value will often beat out a player who can’t play on specials when it comes to roster makeup. Looking at the Bills roster, there will be two placekickers in camp but it’s just about a given that Stephen Hauschka will be the Bills guy. 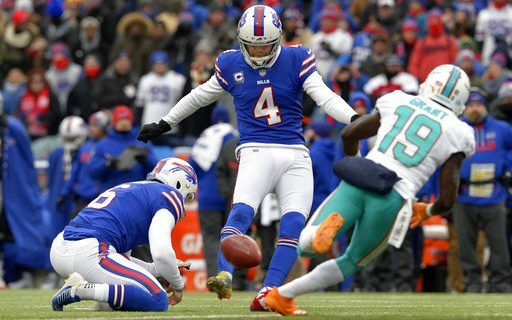 Last year Hauschka made 29 of 33 field goal attempts including seven over 50 yards. Numbers like that are hard to beat. At the punter position it looks to be the same. Colton Schmidt is the incumbent and with a 44.7 yard gross average and a better than 40 yard net average it will be a difficult task for anyone to beat him out. The challengers in camp will be placekicker Tyler Davis from Penn State and punter Corey Carter. The long snapper will Reid Ferguson, a second year player from LSU. Since the Bills don’t have a second snapper in camp, it is safe to assume the Bills are happy with the work of Ferguson. Last year the Bills main punt returner was Brandon Tate, who returned 19 punts for a 9.7 yard average. He was not brought back so there will be a competition in training camp for that job. Going into camp the names for the punt return job include backup wide receiver Quan Bray, rookie Ray Ray McDonald and perhaps rookies Taron Johnson and Siran Neal. Tate was also the Bills main kickoff returner a year ago and so obviously there will be a competition for that spot. Among the names who will get a chance will be the above mentioned punt returners as well as running backs Taiwan Jones and Keith Ford. Needless to say, it is an open competition at both spots. Some of the main cover guys on punts and kickoffs come from the group of linebacker Ramon Humber, veteran free agent signee Julian Stanford and second year linebacker Tanner Vallejo, From the wide receiver position the key special teams cover guys could be veteran Andre Holmes, Rod Streater and rookies Austin Proehl and the aforementioned Ray Ray McDonald. McDonald and Proehl are late round draft picks and the best way for them to be a part of this team is to perform on specials. From the defensive back corps, look for the Bills to give a strong look at Taron Johnson, Siran Neal, Kelcie McCray and Phillip Gaines. Guys like Gaines and McCray have already made their mark on teams when they were with other clubs. To get ready for training camp, read some of Greg’s other Bills position breakdowns. That includes wide receiver, offensive line and linebacker.